When hiring for a leadership role, you may be overlooking one of the most important traits of top performers: humility. Sounds a bit counter-intuitive, doesn’t it? Humility is not typically the first trait that comes to mind when you think about great business leaders like Steve Jobs, Jeff Bezos, Elon Musk, or Bill Gates. Visionary, courageous, charismatic – these are the qualities most of us associate with great leaders. The idea of a humble, self-effacing leader often doesn’t resonate. A number of research studies have concluded that humble leaders listen more effectively, inspire great teamwork and focus everyone (including themselves) on organizational goals better than leaders who don’t score high on humility. Case in point: A survey of 105 computer software and hardware firms published in the Journal of Management revealed that humility in CEOs led to higher-performing leadership teams, increased collaboration and cooperation and flexibility in developing strategies. And you likely recall that, in his seminal book Good to Great, Jim Collins found two common traits of CEOs in companies that transitioned from average to superior market performance: humility and an indomitable will to advance the cause of the organization. At a managerial level, traits associated with humility–such as soliciting feedback and focusing employee needs–generated higher levels of engagement and job performance from their direct reports, according to research published in Administrative Science Quarterly. So, what makes humility such an important quality? Humble leaders understand that they are not the smartest person in every room. Nor do they need to be. They encourage people to speak up, respect differences of opinion and champion the best ideas, regardless of whether they originate from a top executive or a production-line employee. When a leader works to harness input from everyone, it carries through the organization. As other executives and line managers emulate the leader’s approach, a culture of getting the best from every team and every individual takes root. In short, leaders know how to get the most from people. When things go wrong, humble leaders admit to their mistakes and take responsibility. When things go right, they shine the spotlight on others. 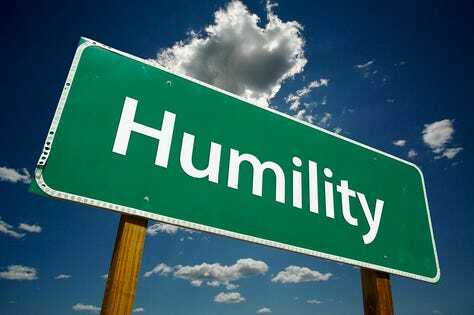 I suspect that humility gets a bad rap because it is sometimes linked with subservience or weakness or introversion. Psychological research actually indicates the opposite. Humility is most closely associated with a cluster of highly positive qualities including sincerity, modesty, fairness, truthfulness, unpretentiousness and authenticity. And there’s nothing about humility that makes it incompatible with strength and courage. In 25 years of recruiting, I’ve observed that leadership is far less about style than it is about execution. Some leaders are screamers while others are quiet and introverted. Some are intuitive geniuses and others are total pragmatists. But regardless of their approach, at the end of the day, leaders must inspire trust, cooperation and commitment among the workforce. When it’s time to make a hiring decision, how do you assess humility in a candidate? Do they credit others? If a candidate fails to acknowledge the contributions of others in helping to achieve their successes, it’s a red flag. Do they admit to mistakes? A humble person not only admits to making mistakes; they seek to understand what they did wrong and what they should change going forward. Be especially careful of candidates who blame others and exempt themselves from responsibility. Do they accept constructive feedback? Does the candidate admit to receiving criticism in previous jobs? How did they respond? Ideally, the candidate will acknowledge the validity of the feedback and demonstrate a thoughtful response. I know a CEO who early in his career was criticized for creating polished pieces of work without talking to anyone else in the organization. The work product was great; the problem was that he received lukewarm support for his recommendations because he didn’t consult key stakeholders. He learned to engage others early in projects, build a consensus and present a united front when he unveiled his work to the broader organization. Do they strive to overcome their weaknesses? We all have skill gaps. Has the candidate recognized their own and sought to improve? I worked with a technology executive who simply dreaded public speaking. I encouraged her to join a Toastmasters group and in just months, she was able to transform a weakness into a strength. Do they help others? In prior jobs, did the candidate demonstrate that they cared about their direct reports, gave them the tools and training, and helped to advance their careers? The bottom line: we tend to be impressed by charismatic candidates with powerful personalities and a commanding presence. My advice: dig deeper. Your gut reaction is often wrong. Search for quiet confidence, humility and a focus on others. That’s where great leadership begins.